Weather has a profound effect on your driving experience, especially when driving a truck. For example, the best choice of tire is highly dependent upon temperature and water conditions. Temperature is also an important consideration for components such as batteries, engine oil and coolant. Many aftermarket accessories can minimize the inconvenience of driving a truck in poor weather. Read more about some of the weather considerations for trucks. Summer tires are typically marketed under other terms such as “all-season” tires or “high-performance” tires. They’re generally designed for driving on a hard, smooth surface, often at high speed. The tread of a summer tire is characterized by large tread blocks with a high degree of lateral stiffness and wide grooves that have a minimal ability to direct water away from the tread. Summer tires are made of softer rubber to provide more traction at high speeds and temperatures. Winter tires, or snow tires, need a tread that will bite into snow and ice. The treads generally consist of many thin cuts, or sipes, that form crisscross patterns across the tread blocks. This characteristic increases the number of edges that the tread has, giving it a better grip on soft surfaces. Winter tires are also made from rubber that improves traction at low temperature. The combination of these features results in a tire with a less stable tread than those found on summer tires. The primary purpose of the treads on a rain tire is to direct water towards the center of the tire and then push it away from the tire. This characteristic keeps the water away from the tire’s surface, reducing the probability of a truck hydroplaning across the road. Rain tires therefore need deeper grooves in the tread to channel the water more effectively. They’re also made from softer rubber to provide better traction on wet surfaces. Look for tires with a traction rate of at least “B” if you expect to drive in wet weather frequently. A battery’s ability to start a truck can be significantly affected by temperature, with cranking amperes (CA) being one of the most important performance indicators. CA is the amount of current in amperes that a battery can deliver at a particular temperature such that the battery maintains 7.2 volts for at least 30 seconds, assuming a standard 12-volt lead-acid battery. 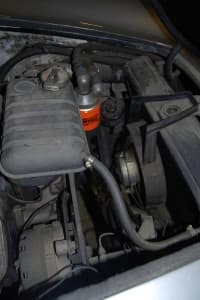 A CA without any qualifiers typically refers to a cranking temperature of 32 degrees Fahrenheit, which is a good indicator of the battery’s overall performance. Cold cranking amperes (CCA) is the battery’s CA at 0 degrees Fahrenheit, which is more useful for measuring a battery’s ability to start the engine in cold weather. CCA is also the metric most commonly used to compare the cranking ability of different batteries. Hot cranking amperes (HCA) is the battery’s CA at 80 degrees Fahrenheit, which may be a useful metric in hot climates. Oil generally becomes less viscous as the temperature increases. To be effective, the oil must remain thin enough to move through the engine without becoming so thin that it fails to lubricate the engine. Motor oil is generally graded as XW-Y where X is a number that indicates the oil’s viscosity in cold weather and Y measures the oil’s viscosity in hot weather. The viscosity rating of both values ranges from 0 to 60 in five-unit intervals. A low viscosity is better for driving in cold weather, while a high viscosity is better for hot weather. For example, 15W-40 is a grade of motor oil that’s commonly used in areas that aren’t prone to temperature extremes. On the other hand, 0W-30 motor oil would be a better choice for driving a truck during a Canadian winter. The new synthetic oils are generally better in cold weather than traditional organic oils, although they’re also more expensive. Maintaining an adequate level of coolant becomes a critical concern in hot weather, when an engine can overheat more quickly. It’s essential to wait until the engine is cool before adding more coolant, as loosening the cap on a hot radiator can release pressurized steam. However, some trucks have features like transparent coolant containers and sight glasses that allow you to measure the coolant level while the engine is still hot.